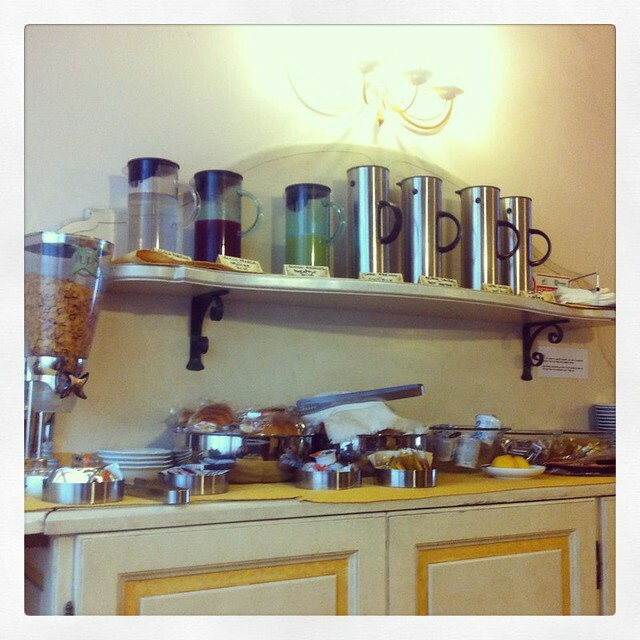 Breakfast at Hotel Moderno was a self-service breakfast bar. The layout was very cute. I gorged on coffee (even this cheap drink is so tasty here) along with a piece of toast slathered with butter. My train to Florence left at 11:11am. It was a non-stop service which meant that it was punctual and very fast. It took 49 minutes to get to the city, in contrast to an hour or so on the normal train. The owner of the hostel I was going to stay at wasn’t at the station as she promised to. For 5-nights, I will be staying at a Chinese-run hostel 民宿, an accommodation I first discovered in Barcelona. I’ll write a follow of this type of hostel soon. I called the aunty and she said she will come and pick me up. I waited a while before I saw a Chinese lady waving her hand at me. She immediately started talking about how we should start sightseeing a little before we go back. I stored my bags with one of her Chinese friends who sell souvenirs opposite the train station. Then we went to a Chinese grocery store where we even used the bathroom. It turned out that Aunty and her friend wanted to go shopping and I was tagging along. 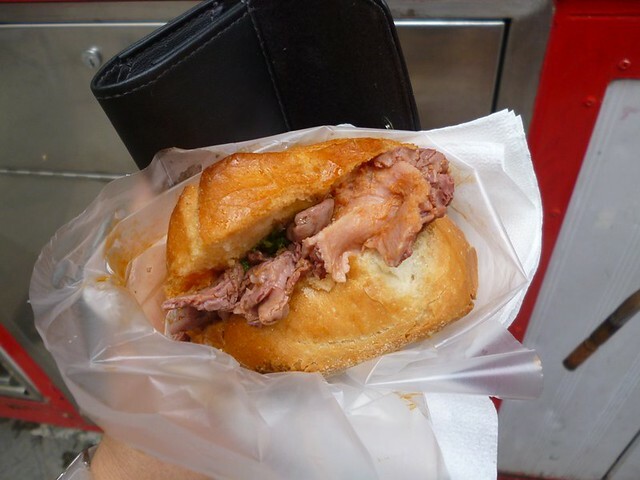 However, they did point out the good eateries and even introduced me to lampredotto (made from the fourth and final stomach of a cow, says Wikipedia). I told them I would go and explore on my own so they can go shopping. 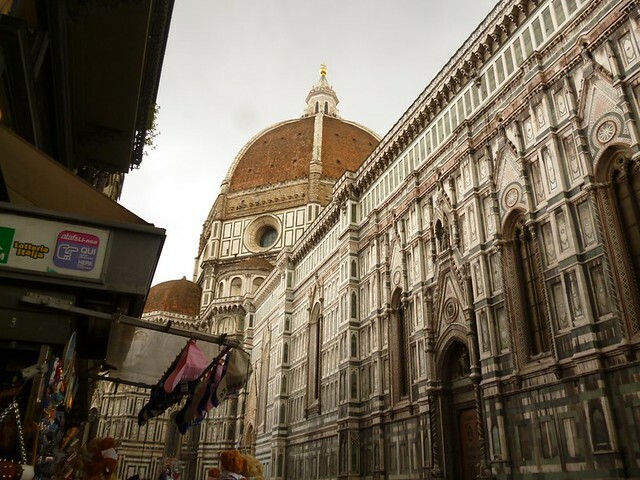 For an hour, I circled the Florence Cathedral which was a piece of art from every single angle. From the photos, you can’t tell that the walls are pretty with green borders and flowers but up close, there is so much detail. While sightseeing, it started drizzling. I hid in the sidewalks of some of the closed shops, admiring the cathedral all the time. I also popped into a makeup store and bought eyeliner. I have been travelling without eyeliner for almost a month! It’s time I get some clothes for my eyes. When it was time, the other aunty picked me up. She showed me the way back to the hostel/house after we picked up my luggage. My backpack was so heavy that I felt that the girl from [spoiler!] Shutter was on my shoulders. I was allowed to pick one of the free beds in the 6-bed dorm. I chose the one on the lower bunk because I like having a roof on top of me. I met a newlywed Taiwanese couple after my check in. Later, they went shopping while I stayed in the house, drinking Ceylon tea, downloading Rick Steve’s audio guides and finishing my posts. The dorm also has dinners for those who wish to eat in. Too lazy and cold to head out, I ate the meal. There was Chinese pig trotters (yummy) and a magically yummy bean-sort of stir fry. Later in the evening, I met the other two Taiwanese girls in my room. One also quit her job but she was only travelling for 40 days in Europe. The other was studying in France for her last semester. It’s quite nice getting to know people even though I’m some times antisocial.